Mo. Governor Orders State Of Emergency, Curfew In Ferguson : The Two-Way He said he took the step to curb violence following last week's shooting of an unarmed black teenager. Most protesters went home before the deadline, but a few hundred remain in the street. A protester holds up a clenched fist Friday night in front of a convenience store that was looted and burned in Ferguson, Mo. "Remaining protesters mingled, chanted and taunted police, some shouting that they would not abide the curfew," AP reports. "Police dressed in riot gear were keeping their distance." Missouri Gov. Jay Nixon says he's ordered a state of emergency and implemented a curfew in the city of Ferguson to curb incidents of violence and looting in the wake of the police shooting of an unarmed teenager a week ago. "We can't let the ill will of the few to undermine the goodwill of the many," Nixon said, speaking at a church in the St. Louis suburb. The order for a citywide state of emergency and a curfew come after the Aug. 9 fatal shooting of Michael Brown. Missouri Highway Patrol Capt. Ron Johnson, who was appointed earlier this week to take over security from the local authorities, said the curfew would go into effect from midnight Saturday and would run until 5 a.m. CT (1 a.m. to 6 a.m. ET). Johnson said a decision would be made on a day-by-day basis as to whether the curfew and other security measures would continue. 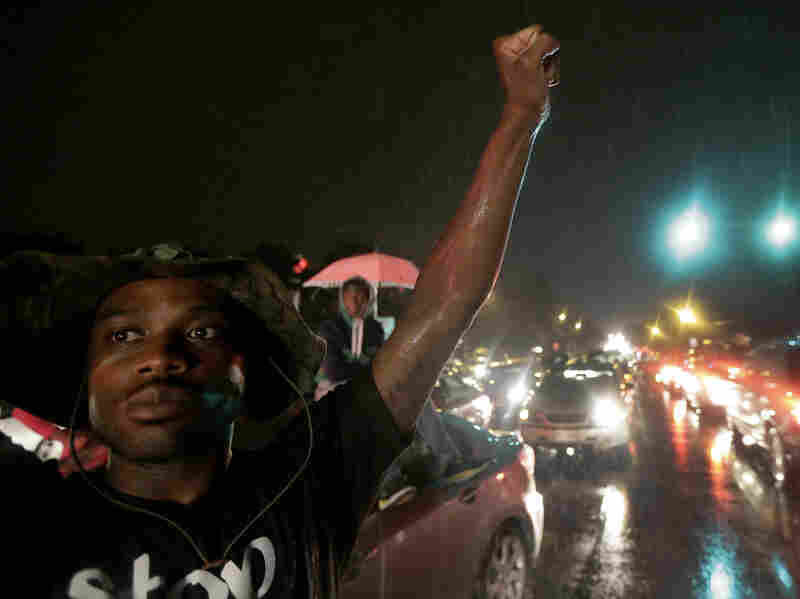 The order follows a standoff overnight between police and authorities and the looting of several shops in Ferguson. As Nixon announced the security measures, he was heckled, with an unidentified person demanding the arrest of Darren Wilson, the officer identified as having shot Brown. "The task that I have at hand, the task of which I have to lead, is to provide peace and security," Nixon said. "Last night, except for a very few, the folks out on the streets of Ferguson were peaceful protesters," the governor acknowledged. As the news conference began to devolve into a free-for-all of heckling, Johnson said: "What we are doing now is not who we are. "Yelling is not going to solve things," he said. "The frustration I hear is in my home, too. "Tonight we will enforce that curfew," Johnson said. "We won't enforce it with trucks. We won't enforce it with arms. We will communicate. "We will survive this," he said. "We will make a change." Johnson said 40 FBI agents were going door to door talking to people in the community who might have information about the shooting.